This afternoon, the City Council’s transportation committee held a hearing on resolutions asking Albany to move forward on two street safety initiatives: legislation allowing New York City to start a speed camera demonstration program, and a bill to close a loophole in the state’s careless driving law. Votes on the resolutions are expected at the full City Council meeting on Wednesday. Most of the hearing today was consumed by heated rhetoric about speed cameras. Two camps became instantly clear. On one side are council members who support automated enforcement, led by Jimmy Van Bramer of Queens and committee chair James Vacca of the Bronx, who had the backing of advocates including Transportation Alternatives and Tri-State Transportation Campaign. On the other side sat the considerably noisier opposition, led by council members Dan Halloran and Eric Ulrich, both of Queens, backed by AAA New York and related lobbyists. Ulrich, in particular, used the hearing to dismiss the dangers of speeding, saying that people who drive 10 to 15 mph over the limit (that would be up to 45 mph on local NYC streets) “pose no threat to anybody else on the road.” In fact, the risk of killing a pedestrian skyrockets as vehicle speeds escalate over 20 mph, and speeding was a factor in 81 fatal crashes on NYC streets last year. After stating that speeding is no big deal, Ulrich attacked the safety record of speed cams. “These are not proven to improve safety. The statistics are bogus. The numbers are fudged,” he claimed. Then Ulrich joined AAA in casting doubts on the city’s implementation of automated enforcement. “I don’t believe them, and I don’t trust them,” he said of NYC DOT. Ulrich and Halloran, like the police union and State Senator Marty Golden, say that the city should hire more officers for traffic enforcement instead of pursuing an automated enforcement program, because cameras cannot determine if a driver is drunk or has a suspended license. There was less opposition to the other measure on the agenda today — allowing police to issue careless driving citations without personally witnessing the collision. 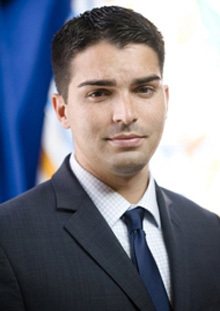 Vacca noted at the beginning of the hearing that the two bills share a common denominator: allowing civil penalties to be issued without the presence of a law enforcement officer at the time of the infraction. The Senate transportation committee will hold a hearing on the Hayley and Diego’s Law loophole tomorrow. It’s pretty galling in this day and age, especially after the recent spate of vehicular homicides, how Ulrich, AAA and others can be so dismissive of the dangers posed by speeding drivers. If the cameras help save lives, as they do, they are a good thing for the city. Wait… Ulrich actually said people who drive 10 to 15 mph over the limit “pose no threat to anybody else on the road”? Please tell me this is a typo. I don’t care what his voting record is before, if there’s any common sense being used that remark is utterly reprehensible. I’ve been hit by a car myself and even at, or below the speed limit, two tons of steel poses a serious threat. Above the speed limit? Well that’s enough to send a person flying up in the air and I still distinctly remembering it happening in Ulrich’s district, in the Lindenwood shopping center, two decades ago when it orphaned my best friend Brian. Councilman Ulrich, prepare yourself for an infuriated phone call tomorrow morning. It’s one of the lowest tricks of a certain kind of politician to say when confronted with something s/he instinctively dislikes but for which there’s powerful evidence to say “not enough research has been conducted”. This is a way of saying, “Research has been conducted – but I don’t like what it says”. There is ample evidence of the effect of speed cameras. In the UK, where I lived until last August, extensive research (despite carping from Ulrich’s UK equivalents) has shown speed cameras, at their height, were saving around 80 lives a year. That’s even though the rules on where they can be placed are highly restrictive. I write about some of the effects here: http://invisiblevisibleman.blogspot.com/2012/10/do-as-you-like-motorists-and-dont-blame.html Research in 2005 found that numbers killed and seriously injured at speed camera sites fell 42 per cent after the camera was installed. Most depressingly in the UK, however, there’s evidence of what happens when speed cameras are shut down. The current UK government has ended what it called the “war on the motorist” and cut support for many speed cameras. In the Thames Valley police area, research showed that, within a month of a speed cameras’ being turned off, the number of vehicles breaking the speed limit at each site had multiplied by between 2.9 and four times. Things got so bad that some villages were begging to have cameras back and offering to pay for them themselves: http://www.ft.com/intl/cms/s/0/b6f2736a-5c94-11e0-ab7c-00144feab49a.html Unsurprisingly, 2011, when many speed cameras were turned off, produced a 3 per cent increase over 2010 in the numbers killed on UK roads, after years of steady decline. People should be honest. Many people think it’s more important to give drivers the freedom to drive whatever speed they want than to save lives. However it’s dressed up, that’s essentially the view of anyone who opposes speed cameras. It would be refreshing if they had the honesty to state their views openly. Even if you subscribe to the “accidents happen” theory of traffic violence, you have to accept that when an unexpected situation arises, the faster you’re going, the less time to react to the unexpected danger. That’s why there’s a speed limit. To suggest that speed cameras wrongly punish “innocents” who are speeding in ostensibly safe circumstances ignores the realities of driving in a pedestrian rich urban environment. What other kind of lawbreaking does this City Council member believe is no big deal? I noted some time ago that some road users don’t seem to think the laws of physics apply to them: http://invisiblevisibleman.blogspot.com/2012/04/am-i-real-to-you-noam-chomsky-and-real.html Councilman Ulrich appears to be on their side. An increase from 30 to 45mph in the speed of half a tonne of metal does nothing either to increase the time it takes to stop or to give it extra kinetic energy. As much as I hate to admit it, I think Ulrich might be right here .Let me explain. If I know the way this city works, they’ll put the speed cams where they’ll maximize revenue. In fact, if the companies running the speed cams get a percentage of fines collected, then it’s almost a given the locations will be cherry picked to maximize fines. That probably means 19 of the 20 active speed cams will be on limited access highways where just about 100% of drivers are 10 mph or more over the limit whenever traffic is free-flowing. Expressways are exactly the one place people driving 10 or 15 mph over the limit do little harm (because the legislated speed limit of 50 mph on the city’s highways is generally way under the design speed of the road). I think it’s important for those active in the livable streets movement to make sure any speed cam legislation specifically states they will all be placed on local streets, not on limited access highways. If we can be assured of this, then there’s no way Ulrich can defend his statement. He may well have been thinking the same thing as me, namely that we’ll mostly be nabbing people doing 60 or 65 mph on expressways, not people doing 40+ mph on local streets. I testified at the hearing today in favor of the resolution, and the comments by Eric Ulrich and Dan Halloran were, frankly, appalling. Kudos to Jimmy Van Bramer for not jumping out of his chair and throttling his distinguished colleagues from Queens, who had the gall to keep pointing out how Van Bramer was their “friend” while talking out of their posteriors. Aren’t these speed cams supposed to go into school zones? The 20 camera test. Is there another section of the speed camera legislation that would be installed outside of NYC? Funny that TA/TSTC are called “advocates” and AAA et al are “lobbyists”. You can be sure that, the way the law is written, the cams will end up in profitable, not safer, locations. Read the actual bill. Buried there is where the cams can be set up is school zones, retirement homes, “speeding locations”, “road geometry”, or other…..basically anywhere. This is a poor replacement for what they need to do, assign a cop to every precinct to write speeding tickets on local streets….no one does that now. Pretty much all speed tickets are on highways. I guess local neighborhoods aren’t worth a cop, you just get a camera. Cams don’t stop drunks, unlicensed, or uninsured. There is no intervention….just “send a check”. Lobbying is a subgroup of advocacy. General, advocates are part of grass roots campaigns which include those lacking power or money. Lobbyists typically do the bidding of the moneyed interests which pay them, Let’s be realistic here. The AAA has a vested interest in fighting any kind of heavy enforcement campaign against motorists, or for that matter anything which will make driving less convenient or more expensive, and hence decrease the number of motorists who constitute AAA’s membership. The problem is pedestrians and cyclists pay the price of making driving more convenient or less expensive. That’s why the advocacy groups came into being. The AAA in essence lobbies because its continued existence depends upon it. TA, TSTC, and most other advocacy groups actually have the ultimate goal of improving things to the point they’re no longer necessary. Do we still have advocacy groups to secure the right to vote for females, for example? No, because this right is now enshrined in our laws. When the time comes that safety and convenience for pedestrians and cyclists is part of the normal public process, advocacy groups such as TA or Streetsblog will no longer be needed. With any luck, I may even live long enough to see this. What’s his record on police brutality? $peed camera$ are u$ed to rai$e road taxe$, mo$tly from $afe driver$. If safety were the true goal for posted speed limits (almost never true in NY), the posted limits would be set at the 85th percentile speeds of free flowing traffic under good conditions. Then there would be WAY too few violators for speed cameras. NY will probably get these predatory speed camera cash registers, and the apathetic public will have only itself to blame for not objecting before the massive road tax system was installed. What you say would be true if the speed cameras were set to trip at 1 mph over the limit. Remember we’re giving a 9 mph cushion before the cameras kick in. Even with speeding in NYC being epidemic, I think it’s safe to say the 85th percentile speed is below the 40 mph threshold where enforcement occurs. The expressways are another story. If we put speed cams on them, it should only be in conjunction with setting the speed limit at the 95th percentile (85th percentile is used for local streets, 95th is used for limited access highways). Pedestrians are killed by speeders. You want to go by the 85th percentile? Fine, the 85th percentile speed of free flowing pedestrians under good conditions is well below the posted speed limit of 30 mph. The NYPD doesn’t take speeding enforcement seriously. In Brooklyn, the precinct with the heaviest enforcement in 2012 issued a whopping 1.5 speeding tickets per day; the next heaviest only issued a ticket every other day. With enforcement at that level, drivers have no incentive to obey the speed limit – the chance that they will be caught speeding is virtually nil. Assigning one lone cop at each precinct to write speeding tickets wouldn’t make a significant difference, and it would divert that cop from whatever he’s assigned to do currently. If drivers know that they’ll automatically be fined whenever they speed, they’ll stop speeding. Let the cops focus on efforts that can’t be automated. Does Ulrich have children? How about we try raising the speed limit by “10 or 15 mph” where they walk to school and play. The false assumption is that MORE or STRICTER laws will solve a problem…without bothering to follow engineering guidelines. enforcement programs vaporize.Would you like to pay a mechanic to do work based on a poll of webcitizens rather then perform credible diagnostics? Would you like a doctor to poll moms rather then perform diagnostic tests to decide if you have cancer? When a jaywalker wearing black at 2am gets hit by a car going 10mph over the speed limit, He dies because he was drunk and jaywalking, but “speeding” is called a factor even though both driver and jaywalker are drunk (this is a common pedestrian accident. The larger point is that people shouldn’t have to die because of a slight lapse in attention, or a moment of weakness (i.e. walking around drunk or even daydreaming). Granted, sometimes collisions with pedestrians are unavoidable through no fault of the driver. However, if speeds were lower, the person might actually survive with few or no injuries. Isn’t that a better outcome than ending up as a collection of body parts scattered across a few blocks? Let’s get real: the cretins who don’t want speed cameras but claim to want more cops would fight tooth and nail to keep taxes from being raised to pay for those cops. The “more cops” argument is a distraction. It’s not put forward by people who care about safety. It’s put forward by cynical lowlifes who are indifferent to the damage they do to the people around them. Because changing the engineering of roads to slow down drivers would be super popular, right? And cheap/self-funding, right? No fights there, right? Everyone would clap and clap and clap for that! We see this all the time when people want to apply paint to roads and call that a bike lane. People roll over like puppies for those. And to speak to your claimed “common” traffic killing (“accident” in your language): notice that to make your point you (a) have to assign a very limited causality to the killing, one exclusively victim-blaming, and (b) pretend to live in a world in which things like the alcohol level in victims’ blood isn’t a commonly cited factor in such killings. Let’s say what no one will say. How come the police can’t keep us safe with 2 1/2 times the national average ratio of officers to population? And why do Republicans defend this level of government inefficiency? (The same reason Democrats defend inequality. The “progressive” era ended several generations ago). In any event, I hope that even if a fine is not issued, a letter is sent if a speed cam catches someone going more than 5 mph over the speed limit, a letter that talks about safety and the possibility of killing a pedestrian. Having people think beforehand about something they would regret for the rest of their lives (assuming their character is unlike that of our “I am the world” pols) WOULD increase safety. Is that the same AAA that keynoted the big bike conference a couple of weeks back — the one that’s partnering with cyclists on street safety? If so AAA has a rogue faction on its hands. This statement is absolutely outrageous. Ulrich’s phone needs to be ringing off the hook. I just called and left a message. People need to phone the papers, phone AAA, write letters. This is the kind of statement that loses elections, and people need to know that the voters won’t stand for politicians and lobby groups who fight against public safety. They are wrong on this one, and the overwhelming public sentiment is against them. This nonsense needs to be called out. You may not like bike lanes or ped plazas, but you probably know someone who’s been injured or killed by a speeding driver. and probably have close calls with speeders on a regular basis. TA doesn’t donate money to candidates. AAA has a lobbying arm that does. Therein lies the difference. Just left a voicemail for his chief of staff. 718-318-6411. The woman who answered the district office phone didn’t know anything. Is there a video of Ulrich making the statement that people who break the speed laws “pose no threat”? If so, you should put that brief clip up on the web, to show what an idiot he is. I’m wondering about the same thing. I’ve been saying for a long time we should cut the police force in half. This would stretch them thin enough so they wouldn’t have enough manpower for stupidity like ticketing bicycles but would still allow them to effectively fight crime. Traffic law enforcement should be as automated as possible, as it is in many other countries. The stuff about speed cameras being no substitute for live policing is bunk. It kind of reminds me of the line from the movie Falling Down: “There’s only one thing you can do to really feel safer. Next time there’s a proposition to cut the number of patrol cars on the street, vote no, OK?”.